Healthy crafting is the key to being able to craft for long periods of time and for the rest of your life. If you knit, crochet, bead, sew by hand or even paint or scrapbook for long periods, you probably have experienced firsthand the problems that occur when you don't practice healthy crafting. Here are some tips on taking better care of yourself so you can enjoy your crafting experience. 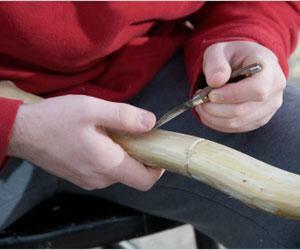 Probably the most common craft-related injury is back strain. No matter what craft you are indulging in, if you sit down for long periods of time without taking breaks, you will likely cause some kind of strain in your back. The key to avoiding back strain is to get up regularly, at least once an hour. Walk around the house or take a short walk down the street. Moving around for just five or 10 minutes every hour will go a long way toward preventing back problems. Stretching before and after craft sessions can also help strengthen the back and limit strain. To begin, stand up straight with your feet shoulder-width apart. Reach your arms over your head and stretch toward the ceiling. Then lower your arms, bend at the waist and try to touch your toes. If you can't reach, don't push it, jut fold yourself over gently and feel the release from your back. Another helpful stretch for the back is a seated twist, which you can do in a chair or on the floor with your legs crossed. If you do this in a chair, sit at the very edge of the chair. Put your left hand on your right knee and turn at the waist to your right, placing your right hand behind you on the chair or the floor. Turn you head to look back over your shoulder, but leave your legs straight out in front of you. Hold for as long as feels comfortable, then turn back to the front and switch directions. While you're at the edge of your chair, put your right foot on top of your left knee (with the left leg bent or straight, whichever is more comfortable). Press down on your right knee gently. This stretch helps your hips, which can also hurt after sitting for long periods. Crafts that involve repetitive motion like knitting, crocheting, beading and hand sewing are very difficult on the hands are wrists. The injuries caused by crafting can be just as bad as those caused by overuse of the computer, so it's important to take your pain seriously. Taking regular breaks is important for the health of your hands and wrists as well as it is for the rest of your body. Stretching during these breaks, as well as before and after long periods of crafting, can help keep your hands in tip-top shape. One of my favorite stretches for the hands involves clasping your hands together and interlace your fingers. Then stretch your hands away from each other, leaving the fingers intertwined. Stretch your arms away from you, pressing your palms out. Hold as long as you like, then switch the twine of your fingers and do it again. Another great stretch starts with your palms pressed together. Your bent elbows should be lifted so your arms are parallel to the floor. Press your palms together firmly, then push one hand back with the other hand. Remember to keep the arms lifted. Then stretch the other hand. Separate the palms so just your fingertips are touching and press your fingertips together. If you have crafted too long and your hands and wrists hurt, you may find that ice provides some relief. Give your limbs a rest of at least a day. Wrist braces can help, but it is best to wear them when you aren't working because they may force your hands to make unnatural movements that could cause even more strain. Reading a pattern in a dark room or beading for long periods of time can cause eye strain. You won't be surprised when I say taking regular breaks to focus on something farther away will help. Other good tips for preventing eye strain include drinking lots of liquid, particularly water, and using eye drops every couple of hours or when your eyes feel dry and irritated. Most crafting doesn't pose a threat of burns, but you can hurt yourself making candles or soap or with an overheated heat gun or hot glue gun. The main ways to prevent these injuries are to monitor the temperature of everything hot, make sure you have all your supplies together before you start so things won't get overheated, and to work slowly and methodically so you don't get in a hurry and burn yourself. If you do get a burn, run cold water on the affected spot, then treat with aloe vera or burn cream. Take ibuprofren if you have any pain and monitor the spot for blistering. Again, you won't have the danger of cutting yourself in a lot of crafts, but there are many that use sharp instruments and scissors so the potential is there to hurt yourself. The main prevention against cuts is not rushing and thinking through what you are doing. I can speak from personal experience when I say that sometimes we don't do very smart things when we have sharp objects in our hands, and we often pay for it. To treat a minor cut, apply pressure until the bleeding stops, apply antibiotic ointment and bandage. More serious cuts may need stitches.